Does your athletic apparel still stink even after you wash it? Traditional detergents are good at removing dirt and stains, but these detergents are not good at getting rid of the stinky sweat smell that can build up in your synthetic athletic apparel. clothing. Synthetic apparel is especially good at wicking away moisture, however it traps the oils and fats from our body in the fibers of its apparel. These oils and fats become a prime food source for bacteria to feast on. As the bacteria digests the oils and fats it releases a foul odor! Unlike traditional detergents, Win Detergent is very effective at breaking the bond between your skin’s oils and your synthetic garments. While getting rid of the stink is what most people are concerned about, using Win Detergent has other benefits as well. By removing the oil and fats from your your synthetic apparel it will be better able to absorb sweat the next time around. In addition, synthetic apparel that is free of oils and fats will stretch better with your body, thus increasing the life of your expensive synthetic garments! 1.) No Stink: removes the oils and fats that causes synthetic apparel to stink. 2.) Better Performance: Synthetic apparel free of oils and fats from our body’s sweat will wick future sweat and stretch better with your body as it moves. 3.) Longevity: Synthetic apparel fibers that are not inhibited by oils and fats will not break down as quickly, thus increasing the life of your expensive garments! *While Win Detergent was designed for synthetic apparel, it can also be used on cotton fabrics. Safe for regular and HE washers. 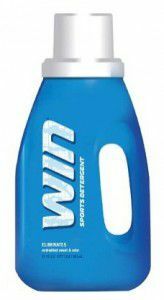 For more information, check out our Win Detergent product page. **FREE TRIAL PACKAGES are available for a limited time. See a cashier or sales clerk in the housewares section.